I get so inspired by other sewing bloggers that sometimes I just HAVE to jump in on ALL the fun. Sorry. It required Caps Lock. While I don’t lack inspiration or ganas, as we say in Spanish, I do lack in follow through. What I do so I actually finish my garments is to have deadlines or some sort of need for what I make. The costumes I’ve made have all been worn to some sort of function, either a comic con or a tea party. If I don’t have an event to wear it to, I have a hard time finishing. Here enters the sew-alongs and challenges of our dear interwebz. (The “z” is totally optional.) These are the ones I’ve joined up with to keep me on the path to finishing what I’ve started. I have wanted to try my hand at the Pattern Magic books and I found a challenge. I hope to meet some new sewing bloggers- other people who enjoy this kind of creative outlet. The Pattern Magic stuff is amazing and I hope to use what I learn to start building on my Pygmalion Costume. This is my long term costume- not gonna finish it any time soon. I’m also working on Halloween costumes for the kids. I was just gonna buy them something or let them pull something together at the last minute since they seem to enjoy that already. What changed is that I got a firm request from the boy. He’s got some high expectations so we’ll see what ends up happening on Halloween. The girl is getting what was gonna be a surprise costume but neither I nor the boy can keep a secret so we pretty much told her. 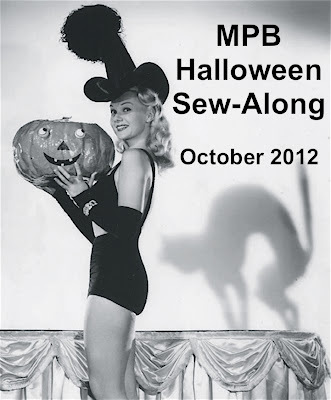 Peter at Male Pattern Boldness blog is hosting a sew-along for those of us making costumes this year. Everyone’s making costumes from different patterns and for different age people but it’s a way to get and give moral support along the way. Here we are at the Frosting Fortnight. It begins soon. The idea is that we’re to pull out the stuff we’ve made that gets dusty from just sitting in our closets. The first week, we pull it out and wear it proudly. The second week, we try to pair the less wearable with the more wearable so your sewn garments get to see the light of day. The interesting thing is that not everyone will consider the same things to be wearable. It really doesn’t matter. We’re not gonna be comparing and telling anyone they can’t wear what they want to wear. It’s just to continue the dialogue and be heaps of fun! Thanks to Mari and Steph for making this happen. So, if you’re wondering what I’m doing. I’m doing this. My coat is on hold as I decide if I’m actually gonna wear it or if it’ll just end up in the back of my closet- which would be a real shame after all the work that I will have put into it. Tell me what sew-alongs, challenges and contests you’re participating in! I wanted to do the Anise sewalong & the Banksia but I’ve just had too many ‘other’ things to deal with. So I’m making aprons!